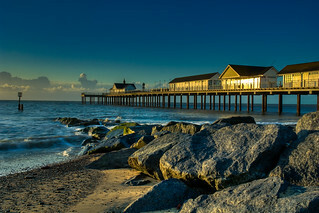 Southwold, on Suffolk's east coast is everything a seaside resort used to be. Thousands of people visit Southwold beach, making it a much loved holiday resort. The beach which has won the acclaimed 'Blue Flag' award for its golden sands, contains an array of colourful beach huts which stretch along the sea front.